America’s fastest growing sport is blazing the trails in Eastern Tennessee. Pickleball has been around since the mid 1960’s and is popular with today’s Baby Boomers because it’s physically easier than tennis and is more social. Players can easily talk with each other because of being closer to the net. 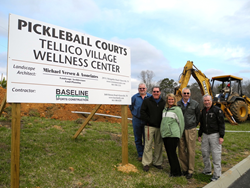 Keeping up with demands, eight lighted Pickleball courts are under construction at the Tellico Village Wellness Center. The Pickleball Club membership has grown quickly at Tellico Village, one of the best master-planned communities in Eastern Tennessee. In just five years, there are 350 Pickleball Club members with a waiting list to join the club. The Wellness Center land parcel is huge and has plenty of elbow room for new Tellico Village amenities. The proposed site plan includes 4 more Pickleball courts, 2 more tennis courts, an outdoor amphitheater, outdoor infinity edge pool, community gardens and Performing Arts Theater. The new 4,000 square foot open-air pavilion at the Toqua golf course is staked out and will be completed by the early summer of 2014 according to Tellico Village. Bulldozers will be on the scene as early as next week. The pavilion is strategically located to capture the dramatic views of the 9th and 18th hole of the Toqua golf course. The renderings show covered dining, a sports bar, fireplace and a cozy outdoor living room. Long term plans at the Toqua golf course include a new golf clubhouse. The nearby Chota Recreational Center looked great with new modern paint colors, a new roof, new landscaping and new entry way to the outdoor pool deck. All the new Tellico Village amenities were budgeted for, monies to be disbursed from reserves, and are being paid for without any new bank debt or special assessments per Tellico Village. In fact, Tellico Village has the lowest debt level of the last seven years and has the strongest reserve levels in seven years, a testament to Tellico Village’s fiscally smart and frugal Board of Directors. Real Estate Scorecard toured the Tellico Village Senior Living facility which is owned by Five Star Senior Living. The 87,000 square foot facility provides 24-hour nursing, assisted living and memory / Alzheimer’s care. Residents have the choice of independent living in one of 21 duplex homes or 40 studio apartments in the main facility. Expansion is planned adding 20 studio apartments and 30+ independent living duplex homes adjacent to the facility. Ground breaking is set for the summer of 2014. The best master-planned community in Eastern Tennessee is a trendsetter when it comes to communication. Real Estate Scorecard met with NextDoor.com during the visit to learn about the private social network established at Tellico Village just over a year ago. Property owners can quickly get the word out about a break-in, organize a Neighborhood Watch Group, track down a trustworthy babysitter, find out who does the best paint job in town, ask for help keeping an eye out for a lost dog, or find a new home for an outgrown bike on the NextDoor network. Tellico Village also has its own private television channel (Channel 3) keeping Villagers informed and through Tell-E-Gram and Tell-Events newsletters. The Tellico Villagers are pretty amazing group of folks who have had a dramatic impact on the local Loudon and Monroe County community. The word ‘no’ is not typically in a Villagers vocabulary. We met with Shauna Oden of Habitat for Humanity, Tom Peck of Good Sheppard, Karen Bowdle of the Good Samaritan Center of Loudon County, Chris Evans-Longmire of Kids First Child Advocacy Center and Lynn Petr of STAR during our visit. These folks came out on a Sunday night to share with Real Estate Scorecard in depth, the involvement Tellico Villagers have in their organizations. LOUDON COUNTY HABITAT FOR HUMANITY - Hit a milestone on March 23, 2014 completing its 100th home. The organization has helped over 35,000 families since 1992. Loudon County Habitat for Humanity builds approximately 8 homes per year helping Loudon County families. GOOD SHEPPARD CENTER OF MONROE COUNTY - Started in 1993, Good Sheppard provides food and clothing to over 2,500 people each month without financial assistance from the federal government. 80-90% of the volunteers are Tellico Villagers. GOOD SAMARITAN CENTER OF LOUDON COUNTY - Founded in 1997, Good Samaritan is private non-profit assistance ministry serving the emergency needs of over 16,000 people in Loudon County. Assistance includes food, medical and dental care, clothing vouchers, and help with utility bills. Good Samaritan has over 200 volunteers and 60-75% are Tellico Villagers. KIDS FIRST CHILD ADVOCACY CENTER - Founded in 2002 by three Tellico Villagers, Kids First CAC provided services to 300 victims of child abuse last year. The over-whelming majority of the children were victims of sexual abuse with the average victim an 8 year old female. They currently serve 22 schools and 4,750 students through their SCAN Program. Nine out of 12 members of the Board of Directors are Tellico Villagers. STAR (Shangri-La Therapeutic Academy of Riding) - STAR works with individuals starting at age four to seniors with physical, mental and neurological disabilities or those considered at-risk. STAR provided 3,849 lessons for 205 participants in 2012. There are over 400 volunteers at STAR and 30% of them are Tellico Villagers. Just through these five non-profits, they have positively impacted almost 60,000 struggling families in the local community last year. For too many reasons to list in this short community news update, Real Estate Scorecard was proud to present Tellico Village Real Estate Scorecard’s 2014 Bliss Award™ for The Happiest Community of the Year during their visit. Tellico Village is a unquestionably a benchmark in the real estate industry and is a place buyers must see if they're searching for the best places to live in the Southeast. Call Tellico Village direct at 888.287.0676 to schedule a tour and be sure to take advantage of their Discovery Package to experience the lifestyle up close and enjoy the Tellico Village amenities.